Fray (Free), the Czech born Toronto-based singer-songwriter Lenka Lichtenberg’s breakout 2011 album, embraced the city’s world music aesthetic and its musicians. Embrace, her outstanding new production, continues to explore and expand that artistic direction. The title lyric of the Lichtenberg song Peace Is the Only Way is a central theme of Embrace. Its refrain is the personal motto of the Israeli violinist, oud player, songwriter and peace activist Yair Dalal. A leading musician on the global world music scene his ideals and spirit, bridging Arabic and Israeli – and other – divides, permeates this album. The spirit of peaceful coexistence among loss and struggle is also present as well in the earlier CDs, the live-off-the-floor Bridges: Live at Lula Lounge and the Songs for the Breathing Walls recorded on site in the Czech Republic. The main directions on Embrace are multifold: world music blendings, songs in the Yiddish theatrical tradition, klezmer instrumental touches and Jewish liturgy. It’s all skilfully linked by Lichtenberg’s effective song writing and unaffected vocals, as well as very effective yet unfussy, lush-sounding, instrumentation. Yair Dalal shares co-composition credits with Lichtenberg on the atmospheric track Perfume Road which begins with an environmental recording of birds outside the recording studio backing Dalal’s free-metre Middle Eastern-inflected oud introduction, segueing seamlessly to Lichtenberg’s crystalline singing of her own Yiddish lyrics. 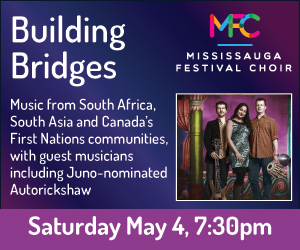 Also to savour: the superb performances by Lichtenberg’s band, Fray, and guest musicians comprising Toronto’s world music and jazz scene A-listers, as well as those from beyond the GTA. Album guests include the well-known Hindustani sarangi player Druba Ghosh, violinist Hugh Marsh and Kevin Turcotte on trumpet. Some of the same material is assayed in Lichtenberg and Roula Said’s 2012 release Bridges, with many of the same musicians. The major difference here is Said’s authoritative Arabic language vocal contributions and the inclusion of songs in the Arabic lineage. I moreover enjoyed the freedom and straightforward arrangements in this live concert recorded at Toronto’s Lula Lounge, as compared with the tightly sculpted Embrace studio magic. This contrast is particularly clear in the extended open-feel instrumental solos in Bridges, giving the virtuoso musicians a change to groove and express themselves. The deeply affecting album Songs for the Breathing Walls refers to the 12 historic synagogues scattered throughout the Czech Republic whose Jewish populations were decimated by the mid-20th century Holocaust. These settings of Jewish liturgical songs reflect the varying onsite interior acoustics of the synagogues, their outside soundscapes (on track 18 Lichtenberg remarks “…birds, cars, bells…everything…”) as well as their history, intimately connected to their congregations. For instance, accompanied by a sole violin, El Maley Rachamim was recorded in a synagogue hidden within the Theresienstadt concentration camp. The personal connections are palpable in her voice: this is the place Lichtenberg’s mother and grandmothers were interned during the Second World War. The exemplary liner notes with translations of the lyrics, photos of the synagogues and notes about their history add immensely to savouring this musical experience. It’s an achievement for which Lichtenberg was honoured as Traditional Singer of the Year at the November 2012 Canadian Folk Music Awards.